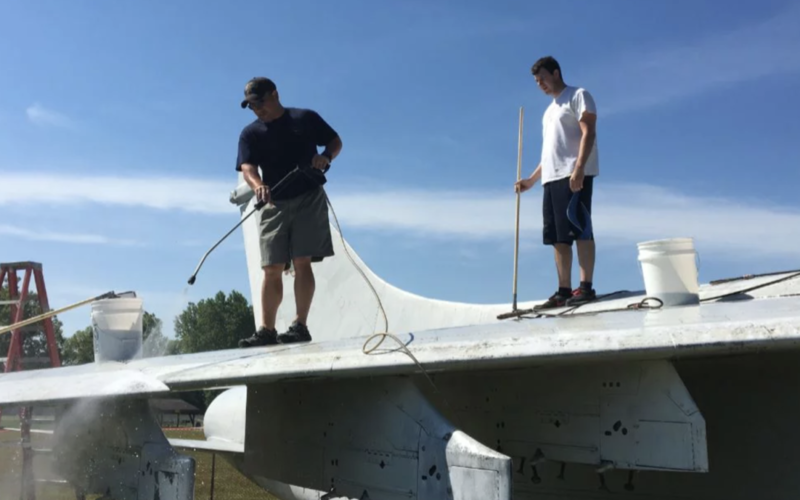 On Saturday, June 10, volunteers from the community and the Flight Deck Veterans Group met to begin the restoration work, which began with scrubbing the aircraft. Volunteers used power washers and scrub brushes to remove 25 years of dirt and debris off the aircraft. Restoration work will continue on Saturday, July 1, with volunteers patching and priming the seams and underwings with paint. Additional volunteers are welcome. “We are grateful to the community for helping us raise the funds necessary to restore this historic aircraft in the manner it deserves,” said Miles. Edwardsville Township office at (618) 656-0292. For more information on the airplane restoration project, visit the project website www.missionpreservation.org.